Vinyl Banners are ideal for indoor and outdoor applications and can be easily customized and installed by you or one of our expert graphic installers. A banner is a great idea for storefronts, grand openings or special events, and tradeshows. Our banners are printed using fade resistant direct print UV ink and can be printed to any size. Feel free to contact an L+L Printers Team Member about any material or service not listed on this site. Colors are very important when creating a banner. Here are some things to keep in mind when choosing the appropriate colors for your banner. Try to make sure that your primary and secondary colors compliment each other. Colors that are not complementary of each other can cause your banner to look distracting. Choose your primary colors so that it will be used for the main message. These main colors must stand out from your secondary colors. Set your secondary colors which are normally your backgrounds so the main message can easily be distinguished. If your colors are too similar then the message can easily blend into the background and make your message hard to read. Contrast is very important when choosing primary and secondary colors. If you want light colored lettering then you want a dark background and vice versa. For help choosing complementary colors, please visit our Color Palette chart for some great examples. When selecting the Font Type for your banners main message, choose the best font that is appropriate for the message you are trying to convey and will be readable from a distance. It’s important to choose fonts that are thicker and look fuller versus scripting or signature like fonts, which tend to be thinner and hard to read. When choosing bold fonts, unfortunately not all bold fonts work well, so make sure you test your font properly before you decide which is the right one. Be careful when using novelty fonts that may distort the actual letters so much that your message must be deciphered like a puzzle. It’s also a good idea to limit the number of fonts to just a complementary few. Using too many fonts could cause the message to look cluttered and unprofessional. In some cases banners have background artwork or logos and pictures that compliment the actual message. As in selecting the proper banner colors, your background artwork must be complimentary to your message. Your background should not overshadow the message and make your banner hard to read. When looking for a banner it’s important to select the proper material to meet your needs. We offer a wide range of banner materials to suit your application. We use 13 & 18 oz. outdoor matte banner vinyl. It is an extremely durable, scratch and fade resistant PVC material that can withstand the elements. We also have 13 & 18 oz. banner material in standard as well as super smooth blockout. The size of your banner. Will the banner be located indoors or outdoors? If outdoors will the location be windy? How will you want to mount the banner? How long do you intend to utilize the banner? 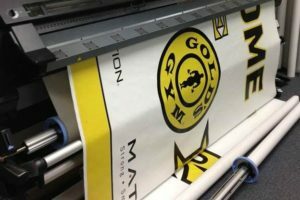 When printing onto a plastic such as vinyl banner material, choosing the right printing ink and banner material combination is critical. At L+L Printers we use the following three ink types for their vibrant output and long lasting durability. Unlike our competition, we do not weld or hem tape our banners. Welding is an inexpensive method of hem finishing but we prefer the classic look of a sewn banner. Sewing allows the banner hem to sit and lay completely flat without the edges curling. We sew our banners using either a lock stitch or chain stitch depending on the type of finishing required. All of our banners include grommets installed around the edges for ease of hanging. Grommets are spaced according to banner size, 2 to 4 feet apart, and at each corner. We offer grommets in brass, nickel and black as well as #2, #3 and #4 sizes. 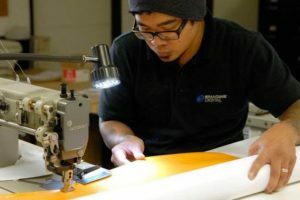 Since we do our own in-house stitching, we have the capability to produce a custom vinyl banner of almost any size. If a seamless banner is what you want, we can accommodate sizes of up to 10′(120″in) feet tall by 100′(1,200″in) feet or as long as we can get the material. For extra wide or large size banners please Contact one of our Sales Representatives and we will be more than happy to help you. When choosing the right banner material for your needs you must take in consideration the weight of the material for your application. At L+L Printers we offer two different vinyl banner material weights. These are 13oz. and 18oz. These numbers indicate the weight of the material per square yard and are priced differently which will be reflected in the cost of your banners. If you are not sure which banner material is for you please contact us and we will be more than happy to assist you. All banners from L+L Printers include the cost of finishing if desired. You can choose to have either no finishing, hemming or Top & Bottom pole pockets. We hem all of our banners in-house. Unlike banner tape or RF welding, hemming is the best and most cost effective option for the durability of your vinyl banner especially in outdoor applications where windy conditions can pose an issue with wear and tear. At L+L Printers we offer a variety of metal grommet options to meet your needs. Metal grommets commonly come in either silver or brass colors. We typically place grommets every 36″ inches on all sides as well as on each corner of the banner. In some instances you may require additional grommets especially for larger more heavier banners or where weather conditions can play a factor, if you are unsure as to what may work best for you please contact us and we will be happy to assist you. At L+L Printers we have invested heavily to provide our clients the latest state of the art printing equipment available. This allows us to print your banners with the highest speed, flexibility and quality. Here are some other highlights of our Custom Vinyl Printing abilities. White Ink printing allows for us to print white ink as an overprint, underprint, spot color, underspot or as a fill color and also as an overspot color. There is a significant difference in quality and appearance between printing white ink versus the absence of color to simulate white ink especially with very dark backgrounds. ECO friendly water-based odorless inks. Up to 1200 dpi for beautiful clean crisp images and vibrant long lasting colors. High speed for faster turnaround time. Our ability to print up to eight colors + white allows us to reproduce colors at some of the largest ranges possible. This greater color accuracy translates to us producing your banners that will meet or exceed your expectations. All of these advantages mean that we can flawlessly print the three most difficult image types in the industry today: Photographs, Gradients and Skin Tones. Please feel free to Contact one of our Sales Representatives if you have any questions whatsoever regarding our print process and one of our representatives will be happy to answer your questions. At L+L Printers we care about the work that we do. Our goal is to meet and exceed your quality expectations. That includes any order large or small. We are here for you day in and day out. Every call to us is answered by a live team member. Our staff is here to help you find the answer you need and fast. If you need something fast, we can turn your order around quickly, Whether that means 24 hour turnaround or even same day service. We will go above and beyond to meet your tight deadlines. We guarantee and take pride with every order we fulfill is backed by our no hassle 100% satisfaction policy. If there is something you are not happy with, we promise to make it right for you.